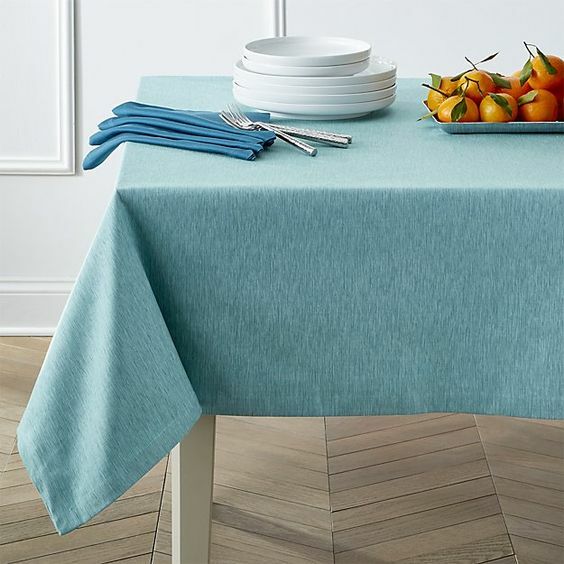 Perfect for spring, this classic Linden Aqua Tablecloth in aqua blue is woven of hand-dyed, cotton and rayon yarns, resulting in rich tone-on-tone color and variable texture. $49.95-$99.95. Buy here. 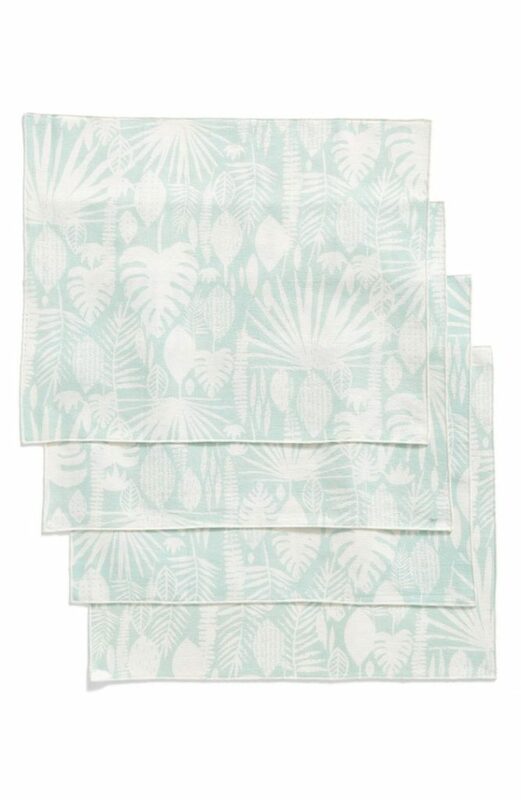 Tropical leaf silhouettes add carefree sophistication to this set of crisp, hand-stitched cotton Tropical Leaves Placemats. Set of 4. $40 Sale $23.98. Free shipping. Buy here. 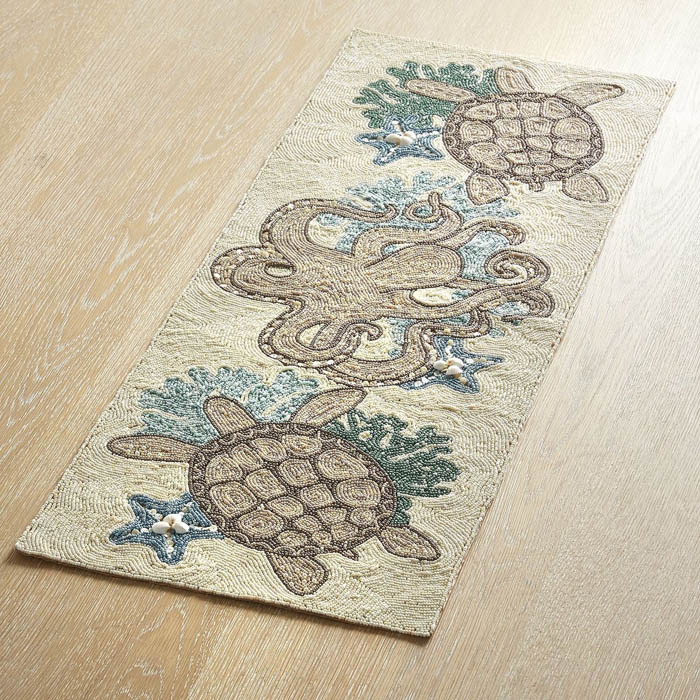 This beautiful Beaded Playful Ocean Friends Table Runners features an array of beaded ocean creatures. Measures 13″ wide, and 36″ or 54″ long. $59.95-$99.95. Buy here. 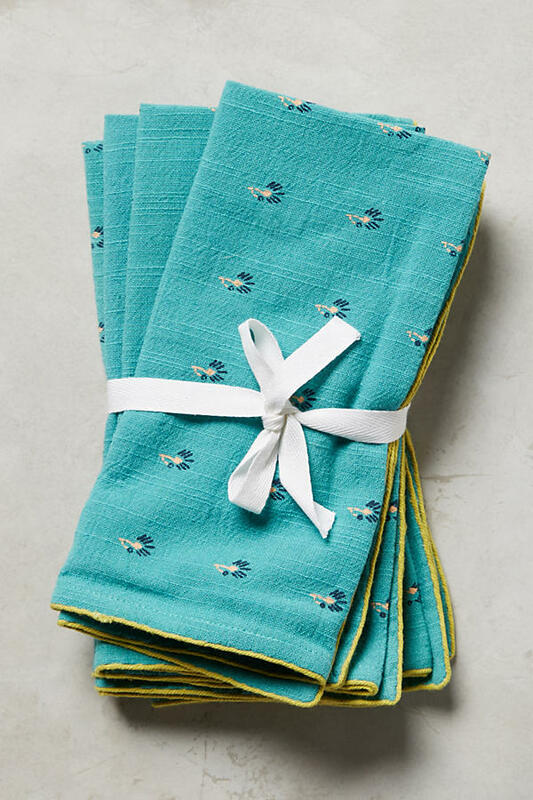 This Lindy Napkin Set adds a pop of color and pattern to your dining table. Made of slubbed cotton. Set of 4. $32 Sale $19.95. Buy here. 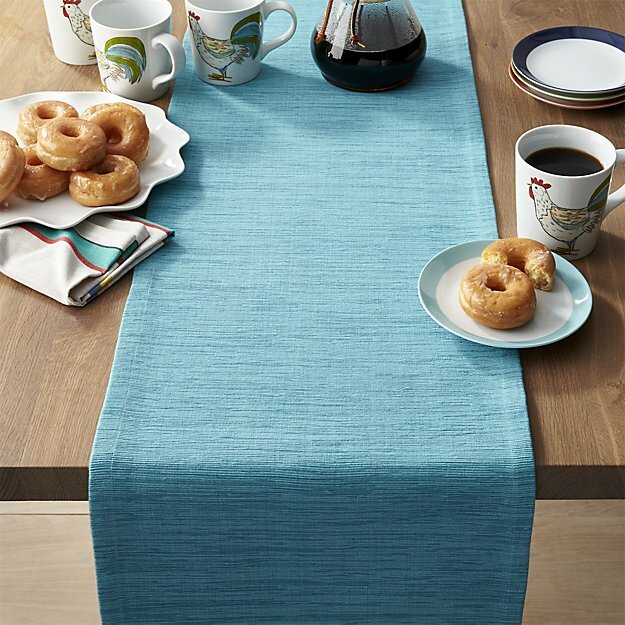 Add a serene touch to your table with these Lenox French Pearl Table Linens. 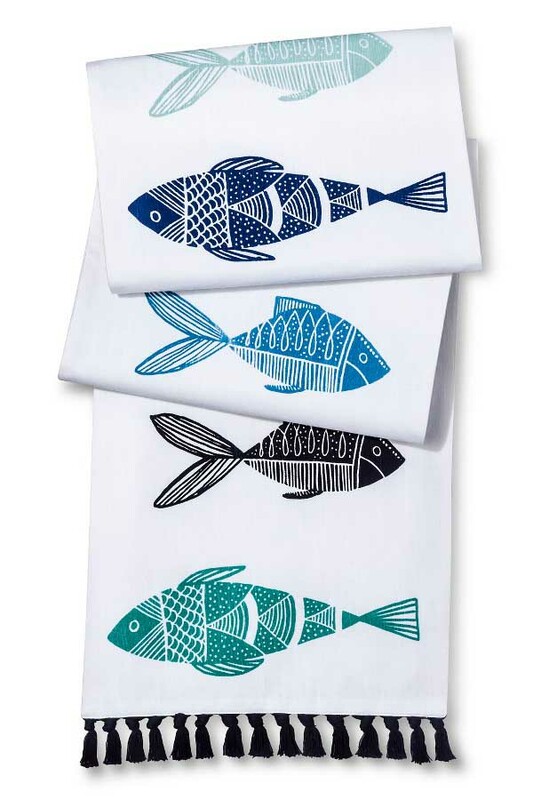 Napkins sold as pair; placemats sold individually. Machine wash. $6-$12. Buy here. 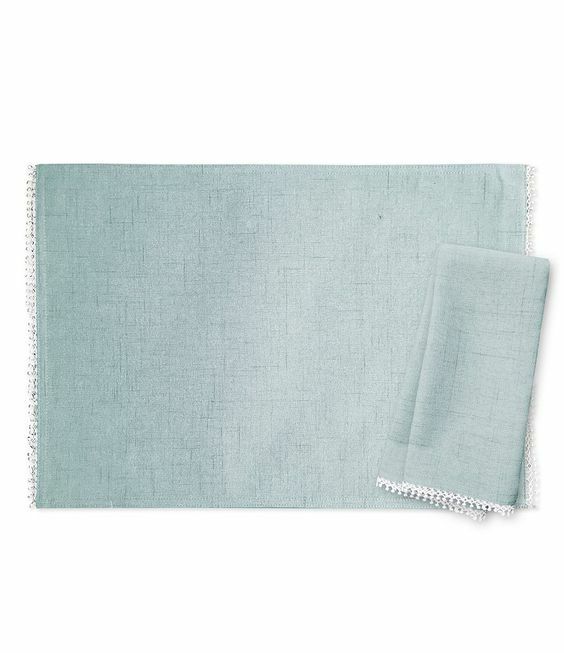 Rich hand-dyed colors in subtle tone-on-tone hues are handwoven into this grasscloth-textured 100% cotton Grasscloth Aqua Blue Table Runner. Old-world, handcrafted techniques used by skilled weavers in the remote villages of Kerala, India, are the secret to the exceptional beauty of these exclusive runners. $29.95. Buy here. 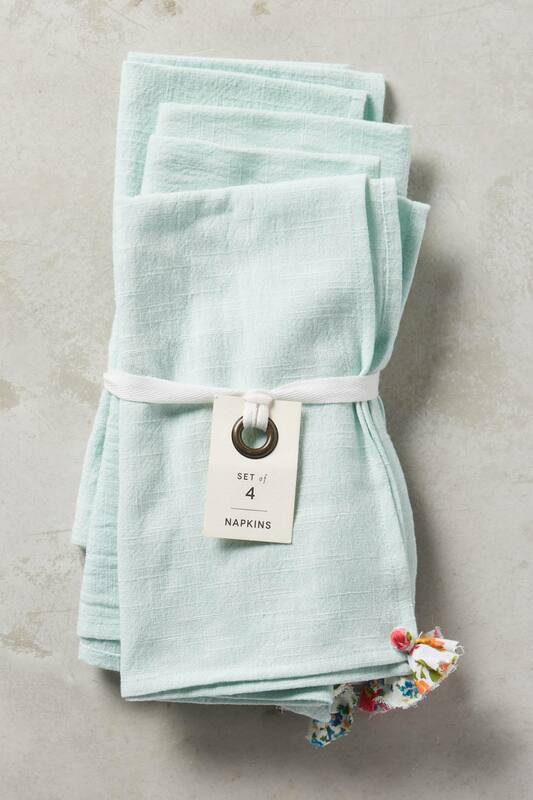 Update your tabletop with this Baubled Napkin Set made of slubbed cotton. $28. Buy here. 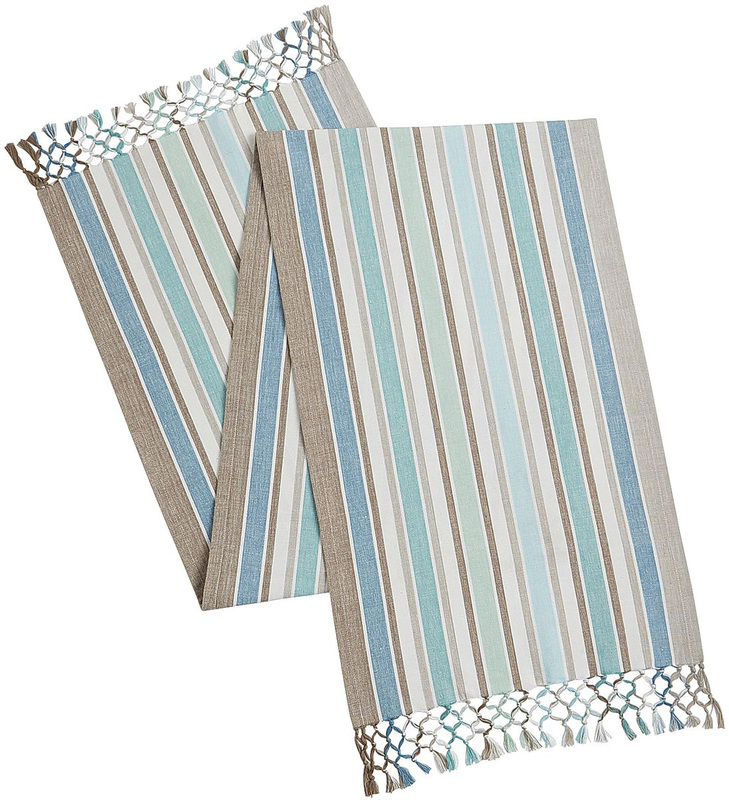 Instantly elevate the look of your dining room with the Threshold Fish Table Runner with Tassels in Blue. 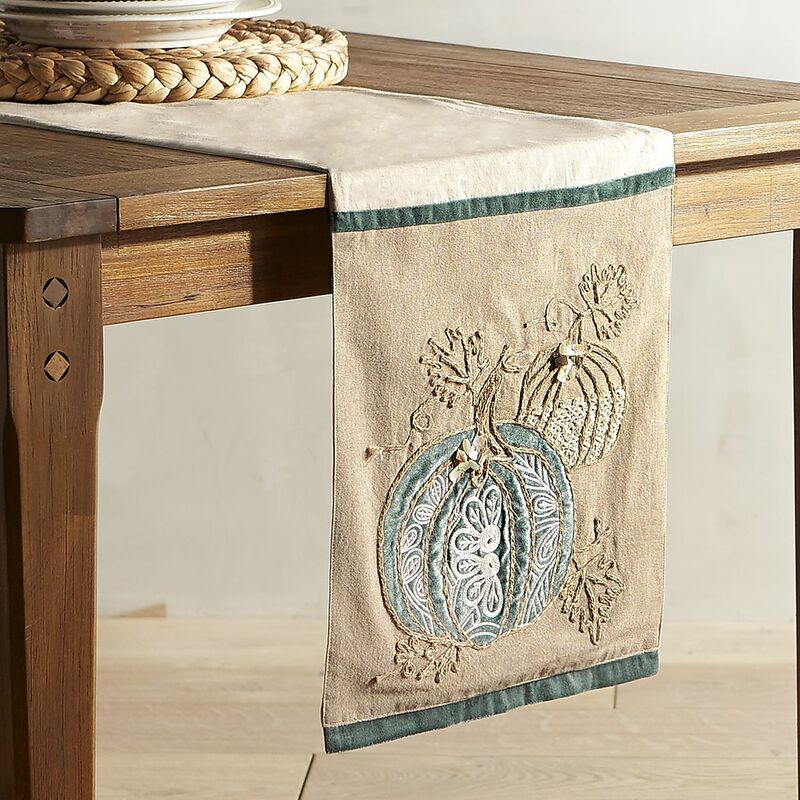 This table runner is made of 100% cotton and is machine washable. $17.99. Buy here. 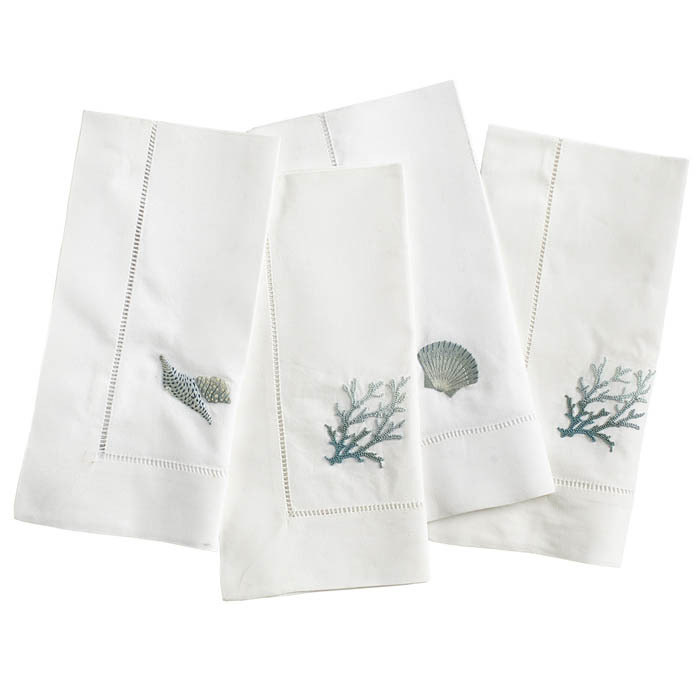 Create seaside ambiance with this set of Embroidered Reef Napkins. 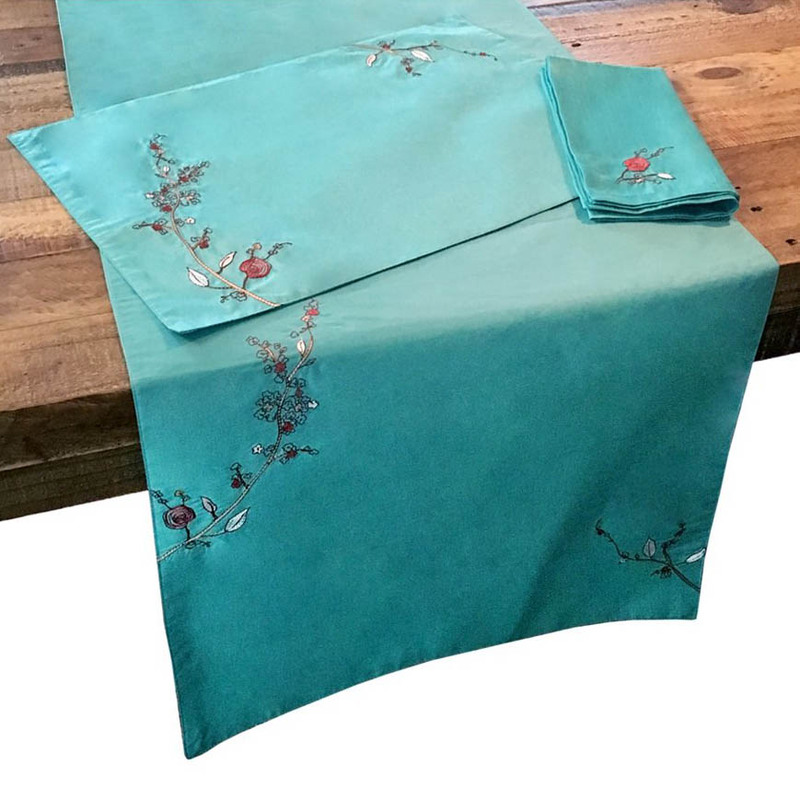 Crafted by skilled artisans in Ho Chi Minh City, Vietnam, each is hand-embroidered with an incredibly detailed French-knot design that has a gradation from a bold teal to a soft powdery blue and lined with a delicate open-stitch hem. Set of 4. $39. Buy here. 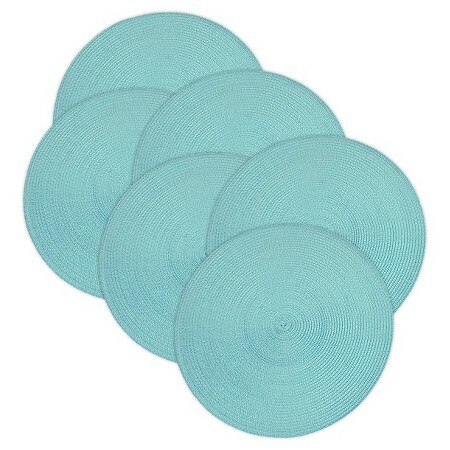 These durable Aqua Woven Round Placemats (set of 6) are easy to clean, just wipe up with a damp cloth. A great way to add a pop of color to your dining area. $29.99. Free shipping. Buy here. 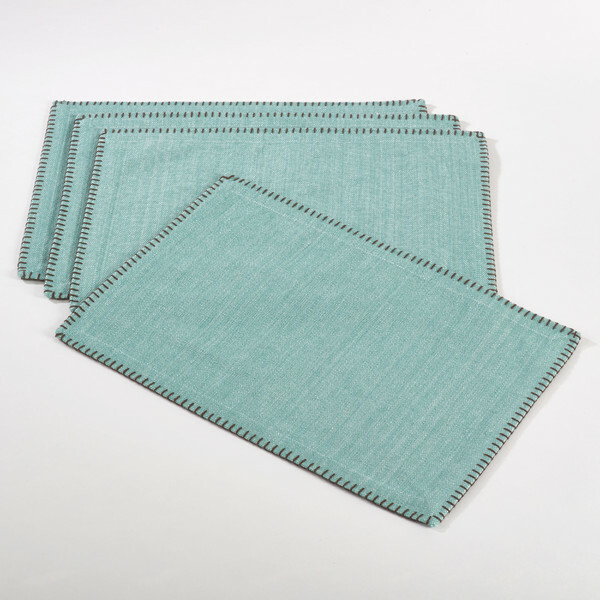 This aqua Celena Whip Stitched Design Placemat (Set of 4) has the look of a more expensive hand made mate. 100% Cotton. Machine washable. $46.50 Sale $39.99. Buy here. Mix and match the Cobalt/Aqua Multi Stripe/Aqua Coral Placemat with other prints inspired by P. Kaufmann for a bright and lively table setting. This versatile combination of stripes and coral accents allow this piece to transition easily between gatherings. $14. Buy here. 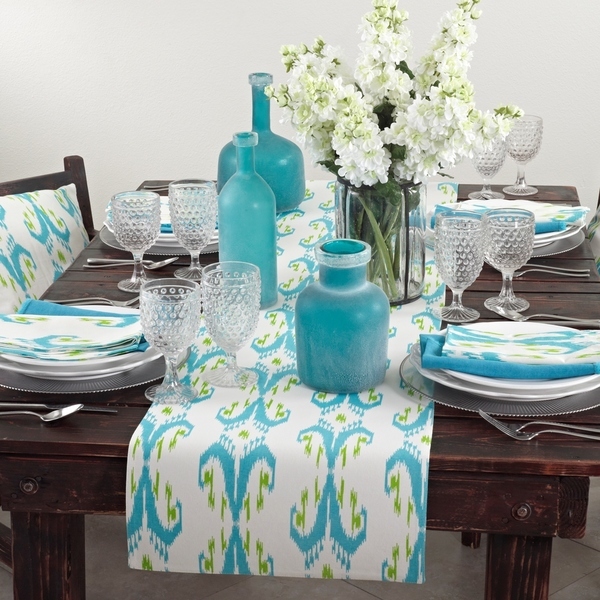 These stunningÂ Lenox Chirp Aqua Embroidered Table Linens feature beautiful floral embroidery. Available as a runner, napkin and placemat. $7-$36. Buy here. 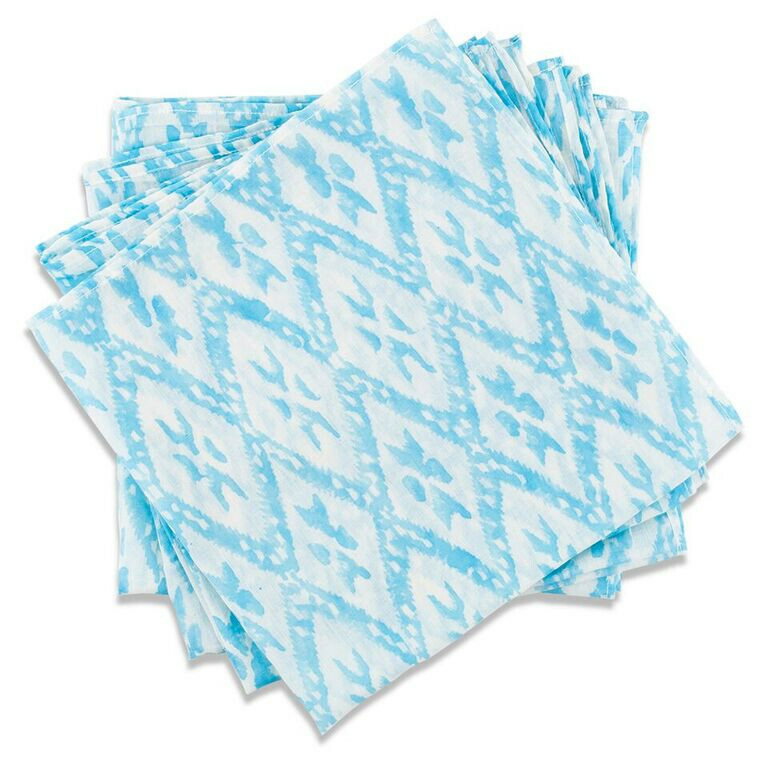 A modern mix for your table, these cheerfulÂ Bright Blue Ikat DInner Napkins add instant appeal to your place setting. $8. Buy here. 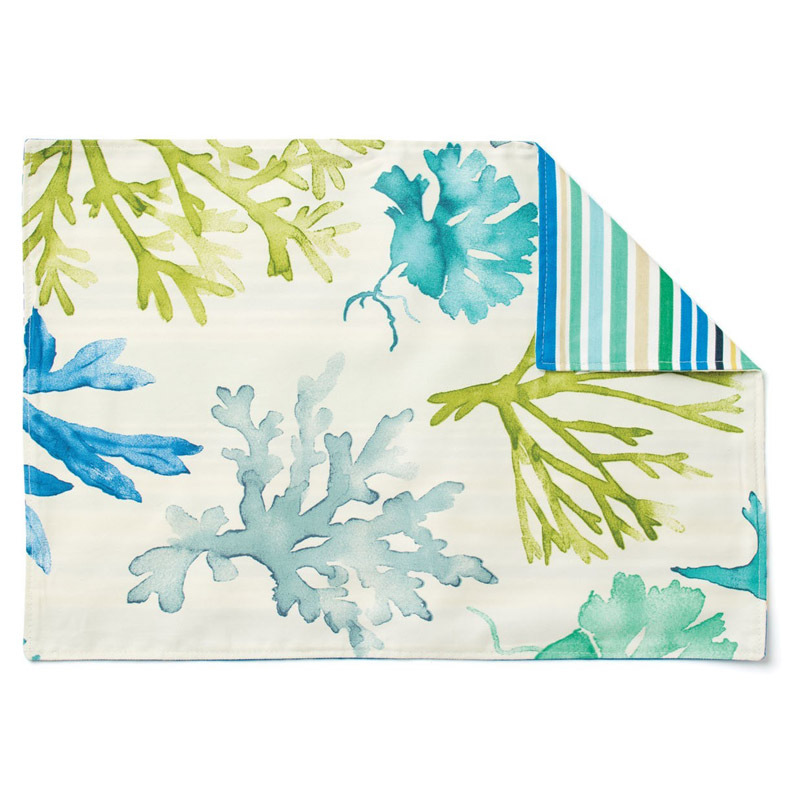 The beautiful blues of the ocean make a striped statement on this handsome, cotton Coastal Stripe Table Runner. $29.95-$39.95 Sale $23.96-$31.96. Buy here. Dress your table in contemporary elegance with Saro Lifestyle’s Ikat Design Printed Table Linens featuring placemats, runners and napkins in a vibrant ikat design. Made of 100% cotton.Â $26.99-$32.99. Buy here.